SDM Joinery was formed in early 2003 initially as a partnership, changing to a limited company in October 2004. The company was founded to continue supplying customers of a local joinery shop that closed down for which the three partners were employees for a combined total of 40 years. Our workshop in Mold, Flintshire is fully equipped with an extensive range of Woodworking Machinery. 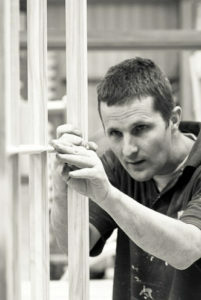 Our skilled workforce enables us to produce a wide range of bespoke joinery products including Windows, Doors, Door Frames, Staircases, Wall Panelling, Bars, Reception Desks & Counters, Conservation Works and Non-Standard Mouldings manufactured in Oak or any timber species our customers specify. We strive to offer high quality products and a friendly service. Our combined extensive knowledge of joinery techniques, timber specifications and UK Building Regulations, ensure we are capable of providing a quality service at a competitive price. We work closely and constructively with both our customers and suppliers which means that whatever your budget, we will endeavour to provide a suitable solution.